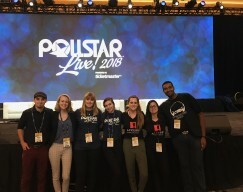 This past week, 7 Entertainment Management students (Ethan Antaya, Valentina Arcila, Emily Benoit, Jennifer Gordon, Ashley Kral, Napoleon McCall, and Meghan Moore) traveled across the country to Los Angeles, California for the 29th Annual Pollstar Live! Conference. Pollstar Live! is a convention organized by and for live music industry professionals to talk about the issues and news surrounding live music. While there, they had the opportunity to network with future employers, and learn about their desired field from the best-of-the-best. Special guest speakers included Coolio, Sharon Osbourne, Garth Brooks, Jimmy Jam, Scooter Braun, and Irving Azoff, just to name a few. How much time will I need to dedicate to my online classes each week?